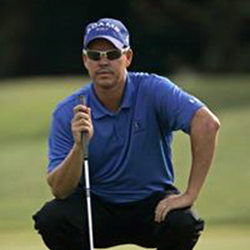 Brad Ott:	Hi this is Brad Ott, Director of Instruction here at TPC Craig Ranch, McKinny, Texas. I want to talk to you about an exercise that I give my students that has to do with line, but in secrecy it's got an underlying speed component. We all know speed is what controls making putts. If you don't have good speed control, assuming the putt has a break to, which most putts will, if you don't have good speed control, you're not going to make many putts. What I'd advise is a exercise that allows you to control your line, you do want to work on your line, but you also control your speed. It has to do with two sticks. It's basically a two stick drill. I love using these sticks for a lot of my exercises I give my students. What you're going to do with this exercise is you're going to set your putter in here nice and square. Now I use a little bit of a unusual putting grip, it's a reverse overlap claw, so I know you've seen a lot of different putts, putting grips, in the PJ Tour and the LPG Tour, the only thing that really matters is what that putter does with the golf ball. If you have an unusual grip, don't be ashamed to use it. It matters only what you do with that putter and that golf ball. Under this exercise, I do what's called a fast medium soft, or a soft medium fast, you got three different speeds you can make a putt with. Soft, which is where it barely creeps in the front edge. Medium, which is where it hits somewhere to the back and the white part of the cup, and then firm is where it hits the back of the hole. This exercise that trains you to use these three different speeds is real important, so that when you're getting in putts in the golf course, when you're under pressure, you're not just thinking about making it, you're thinking about making it with the proper speed. What I'll do with this is I'll have my students work on their line, they'll get their club face nice and square, and for the first one we'll do what's called a soft. You'll see the ball barely creep in the front edge. The next one, what I'll have them do, is I'll have them work on a medium speed. This one will actually get somewhere near the back of the hole. The last one is going to be firm. What you're trying to do with this exercise, you're not just trying to make putts, you're not just trying to work on your alignment, you're actually thinking about controlling speed. The next time you have an alignment training, whether it's a chalk line, sticks, somet type of putting arch you're using, anything you're working on path, make sure you add a speed component to it. Because speed is what controls the ball and allows breaking putts to go in the hole, which we're mostly going to have, breaking putts. You can use this little exercise, I call it a soft medium firm, you can go firm medium soft, you can go firm soft medium, you can change it up. I encourage you to change it up. The point is always have a speed that you're trying to make the ball with.